If you’ve ever thought about planning a long-term trip to Europe and you’re a non-EU citizen, this is an article written for you. Your couple of months in Europe could suddenly take a turn for the worse when you realize you’ve overstayed because you were going by the old version of the law that differs in one very small, very important way. It’s what almost happened to us. So... read on to avoid the same problem! The Schengen Area is a formed by an agreement that 26 European countries have signed (22 of which are in the European Union) that allows European and non-European citizens to freely travel within these countries without having to cross any borders. These are the countries currently in the Schengen Agreement! All of these countries, open borders — sound good, right? The open-border policy around the European Union makes it easy and convenient to travel from one country to another: avoid the routine passport check and waiting in long immigration lines, lessening the stress of coming into a new country. So, when does it get messy? If you’re traveling for a short period of time, you’ll get to enjoy all of the benefits of the Schengen agreement just fine, but if you’re traveling through Europe long-term and you’re not an EU citizen (like Robert, for example), you’ll only be allowed to stay and travel in the territories of Schengen states for a maximum of 90 days in any 180-day period. The 90 days are cumulative, so they don’t need to be continuous. For example: you can stay 30 days in Italy (Schengen), then leave and spend 30 days in the United Kingdom (non-Schengen), come back in and stay 45 days traveling through Spain, France, and Germany (Schengen), leave again for 40 days to Bulgaria (non-Schengen), and then stay 15 days in Portugal (Schengen). Within a stretch of 180 days counting backwards, you could not have been in the Schengen area more than 90 days. Once you hit that limit of 90 days, you essentially have to balance it out by staying outside the Schengen area for some amount of time. The 180 days do NOT renew — your 90 days do not reset. If you’re counting the day you come into the Schengen area as “Day 1,” just know that on “Day 181,” the record of countries you visited within the Schengen area (your “90 days”) does not reset. Prior to 2013 (more on this below), this was the simple interpretation that you had to follow. But as the law stands now, as of 2018, the 90/180 rule is a rolling count, which means that when you leave the Schengen area, the immigration officers will check to make sure you haven’t exceeded your 90 days at any point in the previous 180 days. There are endless discussions on forums and blogs, especially after the amendment to the law in June of 2013, which leads a lot of people (including us) to confide in an out-of-date interpretation of the 90/180 rule. We thought that after our first 180 days, we were free to spend another 90 days in the Schengen area, regardless of where we had been on "day 180." For this past month, we’ve been in contact with the Migration and Home Affairs of the European Commission office to sort this problem out. Not only that, but we’ve been researching every possible piece of information we could get our hands on — new and old. If you follow the official rules and use the tool mentioned below, you’ll avoid any unnecessary surprises during your trip. What tool can I use to make sure I’m not overstaying in the Schengen Area? If you want to make sure that calculations are immigration-officer-correct, you can use the official calculator that the Migration and Home Affairs of the European Commission provides. This will tell you either of these two things precisely: the exact day you’ve “violated” the 90/180 rule (and have overstayed your welcome), or the exact amount of days you can stay in the Schengen area taking into account all of your recent stays. (Keep in mind that the day you enter a country and the day you leave both count towards your 90 days). As wonderful as this tool sounds, you have to know how to use it. And it doesn't have most modern or intuitive interface. This is calculated for you. The exact days of your stay according to the first two entries. Go ahead and enter in all of the dates you have planned, including those outside of the Schengen area. 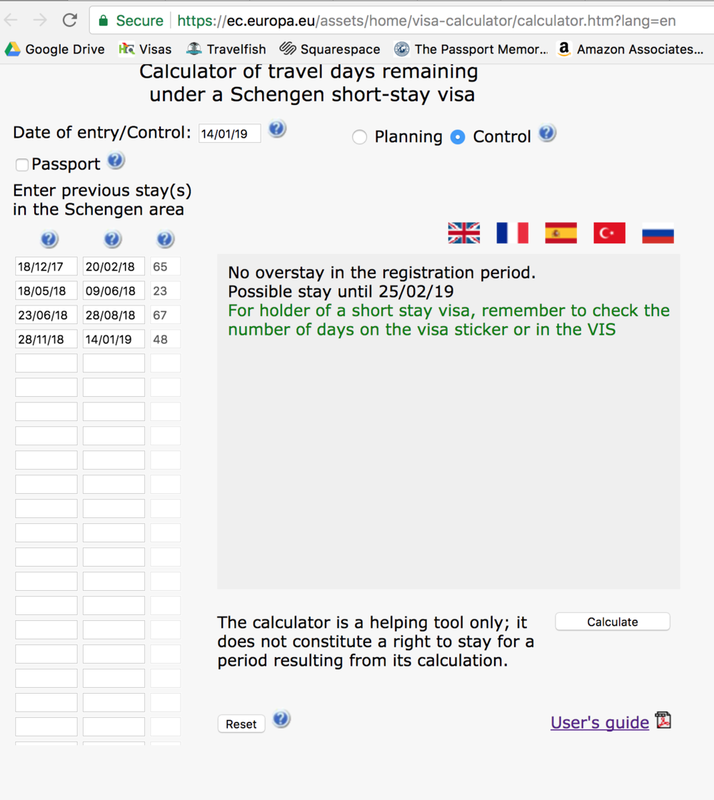 If you just want to see how many days you can spend in the Schengen territory, select “Planning” on the upper right-hand side and just like in example 1, enter Your Date of Entry (in the first box) and Your Exit Date (in the second box), so that your stay is calculated in the third box. Do this for all of your dates. Lastly, in the box on the upper-left hand side named “Date of entry/Control,” enter a day in the future when you’d like to go back to the Schengen countries. Finally, click “Calculate.” This should give you the amount of days you’re allowed to stay within the Schengen area while still adhering to the 90/180 rule. As you can see in the following example, we wouldn’t be overstaying and are therefore able to spend a few extra days in the Schengen area. What are Some Countries in Europe That Aren’t Part of the Schengen Agreement? These are the countries, as of early 2018, that are in Europe but are NOT a part of the Schengen Agreement and therefore do not count towards your 90 days. These are good alternatives while you wait to get back into the Schengen area. Ukraine, Montenegro, Serbia, Albania, Belarus, Moldova, Macedonia, Kosovo, Bosnia and Herzegovina, Ireland, and United Kingdom. And non-Schengen countries that may soon be included are: Romania, Bulgaria, Croatia, and Cyprus. We hope this helps some of you who are planning on staying in Europe long-term! Let us know down in the comments if you have any questions and we’ll do our best to answer them!